Bank holiday weekend + loads going on = short writeup this week. Egg hunting (and scoffing) outweighs egg chasing at this time of year!!! I took a bit of light-hearted stick on the Twitter machine for using the term “strangling D” to describe the way Leinster managed to dominate this contest without the ball so it serves as a perfect title for the writeup! Maybe it seems strange to be praising a team’s defence when the opposition posted 24 points but that is just one of many statistical oddities surrounding the match. 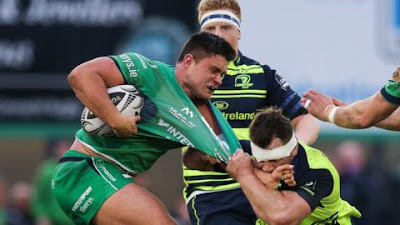 Basically the story went like this - Leinster showed awesome line speed & tackling, Connacht worked hard to find ways around it and often scored points, but every time they did, we hit back with even more. The opening fifteen minutes of the second half is the best starting point. Leinster’s lead was just one as Ross Byrne took the kickoff, and his chasing tacklers were penalised for not rolling away. From there the home side went on multiple long series of phases...one had 15 before they won a penalty for a high tackle by Dominic Ryan; the next had 10 before the ball was knocked on (which is when Dave Kearney suffered his latest injury setback - seriously, the poor guy has no luck at all). You’d think 25 phases would represent significant march up the field for Connacht but the reality was that every time they’d gain a few yards they’d be knocked back where they started from and beyond by not only Leinster’s line speed, but also a seemingly telepathic awareness of where the ball was heading. Finally on the third attempt they were successful, with a well disguised pass from Tiernan O’Halloran helping them get some space up one touchline before they got it quickly out wide the other way where Heffernan was able to dot down. Ronaldson couldn’t cope with the Galway gusts to add the extras but it was a vital opening score for the home side in the second half. The thing is though, while it took them all of ten minutes of seemingly relentless pressure to go in front for the third time on the night, it took Leinster all of two minutes to hit back. Naulia Dawai was impressive off the bench overall for Connacht but off the restart he tried to run out of his own 22 before having it stripped in the tackle...just like that we were on the attack ourselves. From here we had strong carries from man-of-the-match Josh van der Flier and Sean Cronin before skipper Rhys Ruddock got it the rest of the way. Ross Byrne was able to add the conversion which meant all that hard work done by Connacht to squeeze five points out of our defence was undone by seven down the other end. All of this came after a first half where we outscored our hosts by three tries to one yet, as I said, only led by a point. This was partly due to Ross Byrne also struggling with the western winds, but it was also thanks to our managing to ship penalties down the other end right in front for Ronaldson to keep his side close, the first of which came with the match just a minute old. We then struck back with two tries of our own - I thought maybe Adam Byrne’s offload to Kirchner for the first might have been forward but while referee Ian Davies did consult the TMO, it was only for the grounding. There was nothing wrong with Byrne’s efforts for try number two, however; he was in the right place to intercept a pass from Ronaldson and even from inside his own half nobody was going to catch him. Still, the reigning Pro12 champions kept at it and their opening try was easily the best of the seven from the match. Leinster’s attempt to shut down their offence involved something of a risk in that our tackle cordon was kept narrow which left spaces out wide. After stretching us in one direction, a perfectly executed kick pass from Jack Carty sailed over Adam Byrne straight to Danie Poolman who went under the posts. But again Leinster were able to hit back, and while I don’t have numbers to back me up on this, I firmly believe we are among the best in Europe at scoring shortly after conceding a try...van der Flier was able to block down their clearance after the restart and soon after we earned our own penalty to regain the lead. Keeping Connacht’s attack honest was only ever going to be half the battle for what was very much a patchwork Leinster matchday 23 in between two big European knockout games. We also had to be quick to pounce on even the tiniest opportunity and it was in our third try where we demonstrated this ability the most. As the half was entering its final stages, Luke McGrath tried to win another pen by throwing the ball against an offside Sean O’Brien (the western version of course!) only to get the ball back himself. The scrum half wasted no time spotting an opportunity to sprint towards the Connacht line before being hauled down. This time it was up to us to make the most of space out wide and a lovely long pass from Ross Byrne fell to van der Flier who had a two-on-one, but still needed his timing to be perfect when he both shipped it to Rory O’Loughlin and blocked the tackler allowing his centre to score. That’s six tries covered; the last was tough on the home side who probably deserved at least a point from the night, but once more it was our defence forcing them back as the clock wound down and eventually a mistake saw the ball bounce perfectly for Barry Daly to apply the icing to the cake. Special mention for John Muldoon - Connacht’s consummate captain. Not the best way for his 300th appearance for his beloved province to pan out but despite the result he showed his full range of talents both in back row play and leadership (especially in dealing with Bundee Aki whose persistent whining to the ref got him in a spot of bother towards the end). A true warrior. I’d be lying if I said Leinster’s performance was flawless...we were lucky to concede 13 penalties without a yellow card, there were a couple of yips on our lineout throw and even the tiniest system error in our defence was punished. Was our line speed down to our timing or did we stray offside once or twice? Well, when I’ve said it about teams we’ve faced in the past I was told “you have to play the whistle”. But you really have to work hard to ignore the mitigating factors...an unusual Leinster combination, away to the reigning champions, with a massive game in Lyon just over a week away - to leave the Sportsground with not only maximum points but also a home semifinal in the bag with two games to spare is an achievement we’re very happy with here at Harpin Manor, that’s for sure. And when you consider the quality displays we saw from Josh van der Flier (24 tackles, none missed), Rhys Ruddock and co starting, and decent cameos from the likes of Ian Nagle off the bench, all of whom are likely to miss out on starting next Sunday in Lyon, then you have to be happy with the state of affairs at Leinster Rugby right now.